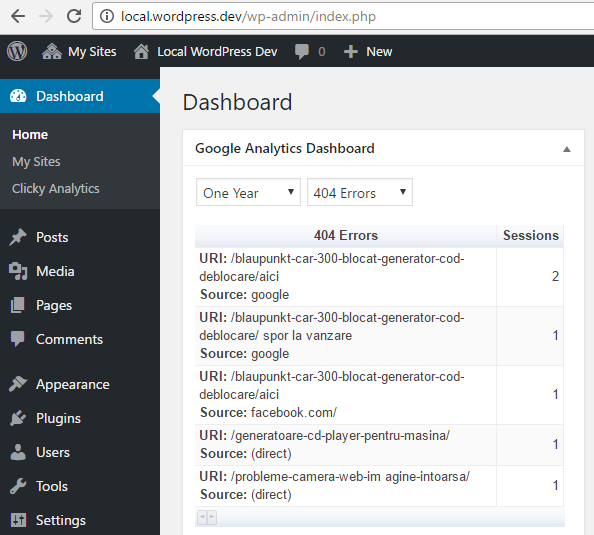 In Google Analytics Dashboard for WP 4.9.4 we’ve introduced a brand new report which will enable you to keep track of 404 errors generated on your website. A new year-month dimension is now available to allow you to easily identify the most successful publication months of the year. We’ve also made some improvements by optimizing the cache system, by changing the way charts are loaded and by allowing you to specify a Google Maps API Key for the Locations report. In addition, we’ve fixed some bugs like: switching to get_sites() to avoid deprecation warnings in WordPress 4.6 and fixing a PHP7 notice which was preventing the Properties/Views Settings list to be properly displayed on multisite installs. The 404 Errors report, introduced in GADWP 4.9.4, enables you to easily keep track of 404 errors and find the source and path of all 404 errors generated on your website. If you’re using a localized version of WordPress or you’ve changed the default title of your 404 error pages, please update the value of 404 Page Title contains option, under Google Analytics -> Backend Settings. The default value of this option is Page Not Found.